Sholanda Regan of South Lumberton tells the story of her family – and her community’s – struggle to recover from multiple storms. As lawmakers gathered Monday to approve funding for Hurricane Florence relief, residents and community leaders from Eastern North Carolina came together outside the General Assembly. They told their personal recovery stories and encouraged lawmakers to put recovery money – and their political power – where it’s most needed. 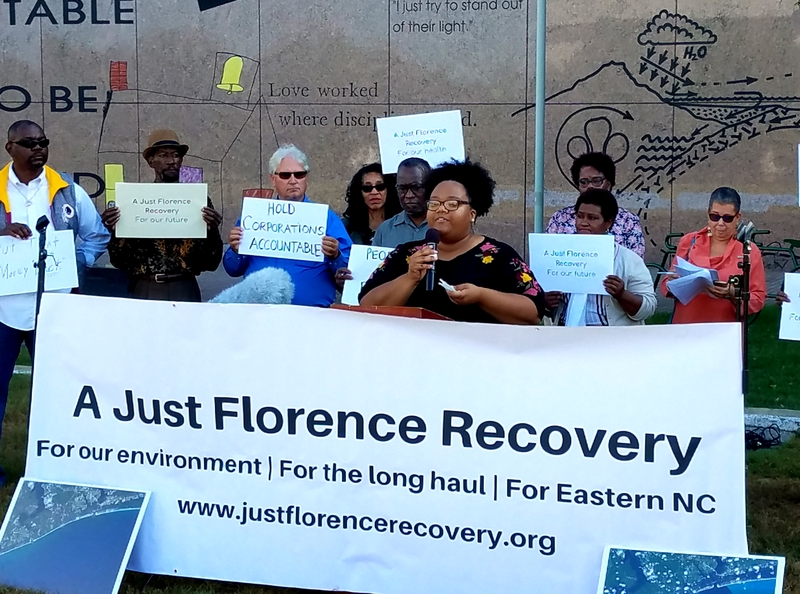 The Just Florence Recovery Collective represents more than 25 community organizations and dozens of impacted residents. 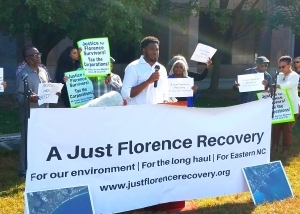 Its goal: to shed a light on racial and class disparities that have made storm damage worse and recovery slower in North Carolina’s poorest and encourage those in power to reverse the trend and make those communities whole. For over 60 years unlined coal ash basins have harmed drinking water in and around his community and been released into the Neuse River, Jones said. The result, Jones said: levels of arsenic 18 times higher than safety standards for drinking water. “We need to hold Duke Energy accountable,” Jones said. “We need to hold the people who work over here accountable,” Jones said, pointing toward the legislature. 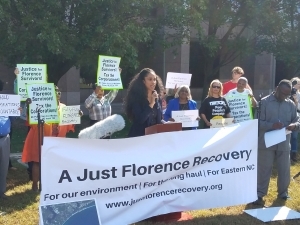 Addressing legislators, Jones said Eastern North Carolinians are making a simple request of legislators who have given tax breaks to and eased regulations on companies whose pollution has devastated the state and its residents. “We are asking you extend to the citizens of North Carolina just a fraction of the favor that you extended to Duke Energy,” Jones said. From coal ash contamination to millions of gallons of hog feces unleashed in flood waters and into waterways, La’Meshia W. Kaminski said the location of the damage is not a coincidence. income communities and communities of color, who are already burdened by decades of pollution,” said Kaminski, one of the organizers of Monday’s event. The areas hit hardest by the storms of the last two years need immediate and adequate funds for relief, Kaminski said – but they also need elected officials to address the root cause of the environmental disasters in the wake of the storm. Both need to be free of legislative restraints, she said. Kaminski called for the override of that limit and release of the full funding needed – closer to Gov. Roy Cooper’s suggested $1.5 billion than the $800 million discussed Monday. Twenty-eight counties in North Carolina have been identified by FEMA for federal disaster assistance. About 2.6 million people live in those counties. The cost impacts from Hurricane Florence have been estimated at $13 billion statewide – more than twice the $4.8 billion in estimated damages from Hurricane Matthew in 2016. Many residents of Eastern North Carolina were just recovering from Matthew when Florence hit. Others have been unable to fully recover. In South Lumberton, Shalonda Regan’s family’s home was declared fit for habitation after Hurricane Matthew – but persistent mold spread throughout and made the first floor uninhabitable. For an asthmatic like Regan, it became nearly impossible to breathe in that environment. Health concerns are even more intense in her community followed Florence, she said, as people continue to report irritated skin, hair loss and other illnesses in the wake of long-standing industrial pollution spread by the storm. Brian Kennedy is a policy analyst with the N.C. Budget & Tax Center, a project of Policy Watch’s organization, the N.C. Justice Center. The state has the money to do what needs to be done, he said at Monday’s rally. Legislators simply need the political will to commit the money and reject tax cuts that would diminish the resources they can use toward recovery. Kennedy said it is time for lawmakers to invest in a recovery that is adequate and addresses systemic racism, classism and inequality that has persisted in the state for hundreds of years. After their rally outside the legislature groups from the rally headed into the building to personally press their elected officials to hear their recovery stories and use this special session to take meaningful and lasting action.